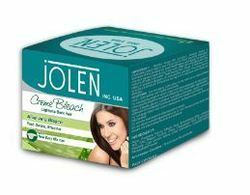 In order to meet excellent quality standards, we are supplying Aloe Vera Creme Bleach. First clean the face, mix 2 spatula of bleach cream & 2 pinches of activator powder together. Make sure the ratio is not less than 4(cream):1(activator). We are amongst the most reputed names in the industry, offering a wide range of Aloe Vera Facial Bleach Cream. - A blend of Diamond serum, Aloe vera, Hira Bahamas and Glycerine. - Lightens Dark Colour facial hair to match skin colour. - Gives extra glow and softness to skin. - Makes skin fair and glowing in just 15 minutes. The first fairness bleach for tough male skin. Specially formulated with aloe vera, HIZ ALOE BLEACH not only makes your skin fairer, but also moisturises it and relieves stress and fatigue signs. This ultimate herbal solution gives you confidence and your skin a healthy glowing look. Recommended for use every 15 days. In order to meet excellent quality standards, we are supplying Aloe Vera Bleach.